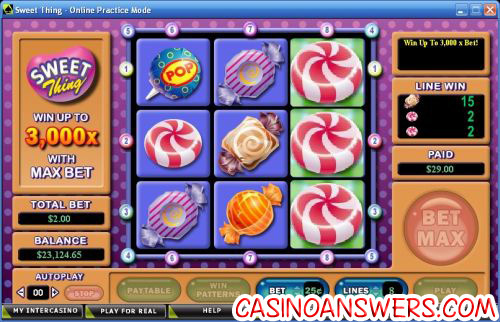 Sweet Thing Casual Slot Guide & Review - Casino Answers! Sweet Thing is a 9-reel, 8-line casual slot game developed by Cryptologic, featuring wild symbols, free spins and a bonus game. You can play Sweet Thing at InterCasino and VIP Casino. Sweet Thing is a candy-themed slot machine. It’s not like most slots where the reels spin. Instead, every symbol is its own reel. Match 3 symbols up/down, left/right or across and you will get a winning combination. To see all of the different directions you can win in, hit the “Win Patterns” button. When you get a winning combination on the Sweet Thing slot machine, it will remove the symbols from the reels and replace them with new ones (referred to as a free spin), much like the Bejeweled slot game. If the symbols that replace the originals match, you will get more winning combinations! The highest paying symbol on Sweet Thing is the Sweet Thing symbol. 3 Sweet Thing symbols in a row will pay out the top jackpot of 3000X your bet per line. The Sweet Thing symbol is wild and substitutes for all other symbols. If 2 Sweet Thing wild symbols appear on the reels of Sweet Thing, you will trigger the Sweet Thing bonus game. The bonus game is a game of Memory consisting of 4 pairs of matching symbols. You will have 30 seconds to reveal as many matches as possible. If you make four mistakes, the bonus game will end. If you make no matches, you will receive a consolation prize. The bonus game can be re-triggered on a free spin. To try the Sweet Thing bonus game out, play the Sweet Thing slot game at InterCasino! Payouts are made according to the Paytable. Coinciding wins on different paylines are added. Payline wins are multiplied by the bet per payline. The Sweet Thing symbol is wild and substitutes for all other symbols to make a winning combination. To use Sweet Thing’s autoplay mode, use the “+” and “-” buttons under “Autoplay” to play up to 99 spins. Hit “Play” or “Bet Max” to begin the autoplay spins. You can stop autoplay at any time by pressing the “Stop” button. If you’ve got a bit of a sweet tooth or if you just like unique slot machines, Sweet Thing is a definite change of pace from your average slot game. If you are looking for the best online casino to play the Sweet Thing casual game slot at, we recommend you sign up and make your deposit at InterCasino! Are players based in the United States able to play the Sweet Thing slot game for real money? Unfortunately, American players are unable to play at Cryptologic casinos for real money right now. For a great selection of interactive slots that are unique in their own way, we recommend checking out the iSlots at the US-friendly This Is Vegas Casino. Where can I find more unique slot game reviews? For more Cryptologic casual game slots, please read our Bejeweled Slot Review, Cubis Slot Review and Jenga Slot Review. You can play all of these games, Sweet Thing and more at both InterCasino and VIP Casino. Where can I find more 8-line slot machine reviews? For more reviews of 8-line slot machines, please read our Chinese Kitchen 8-Line Slot Review and Ultimate Fighters 8-Line Slot Review. Both of these slots are found at Playtech casinos such as Titan Casino. What casual slots are there? Where can I find a unique slot machine?